Buying a digital piano can be quite a daunting task, especially when you have plenty of options to choose from. However, the one quality that you would want your digital piano to have is that it must be capable of delivering sound or music of the highest quality and standard. Apart from this, the size and look of the piano should also be appealing and attractive. In this article, we have compared two different digital pianos, Yamaha P45 88-Key and Korg B1 88-Key digital pianos in multiple categories including their tone levels, key choice, instrument sound, size and overall quality. Continue reading to discover more about their features, specifications and of course pros and cons. In my opinion, a digital piano should look and feel great. After all who would want to own a piano that isn’t ergonomically designed to offer ease of use while being played? Similar to an acoustic piano, the Yamaha P45 digital piano weighs around 36.4 pounds and measures 52.2 x 11.5 x 6 inches. The Yamaha GHS (Graded Hammer Standard) is heavy towards the lower end as well as lighter at the higher end. If you intend to improve your piano finger techniques, then this particular model will definitely appeal to you. The Yamaha P45 comes with matte finish black colored keys, which make them almost non-slippery while playing, especially if you’re planning to play for longer durations. The good thing about this piano is that it is convenient to use. It weighs around 26 pounds and measures 51.6 x 13.2 x 4.6 inches, which implies that it is quite a compact yet affordable digital piano. Korg B1 is available in white and black colors and both are equally good in terms of look and feel. The piano offers amazing chorus and reverberation effects and offers decent sound quality. With Yamaha P45, you’ll get the Advanced Wave Memory, which relies on digital technology for recording sounds similar to that of the acoustic piano. The AWM offers high quality and rich sound, which is something that every piano player looks forward to in their digital pianos. The piano uses L and R waveforms that are easily captured through 2 distinct microphones. If you’re searching for a naturally sound stereo instrument then the Yamaha P45 is undoubtedly a good choice. Its 64-note polyphony enables the piano player to play their preferred notes and passages with ease and perfection. However, what truly sets this piano apart from other digital pianos is its Dual Mode, which enables the player to combine two different voices with each other. For instance, strings and piano can be easily combined for creating exciting new sounds. While other digital pianos come with features similar to their older or existing versions, the Korg B1 is truly unique, thanks to its advanced technology. It does not have any whistles or bells but the basic features that one usually searches in their digital pianos. As far as its sound quality is concerned, it isn’t up to the mark. In fact, it may sound artificial, which is something that you may dislike about it. Korg B1 should have come with more sound options or effects but it is decent enough in terms of the money you invest in it. While, it does offer different types of piano music such as jazz, concert etc., the makers could have added other instrument sounds on the piano to enhance its sound capabilities. One of the greatest aspects of Yamaha is that it offers excellent features at an extremely affordable price. It comes with a weighted keyboard, which makes it ideal for those who have just started their piano sessions or training. Another advantage of owning the P45 model is that it is simple to use and boasts of single button operation. This means that the player can change the settings by using a single button. Apart from this, the users can also hold the “GRAND PIANO/FUNCTION” button for performing various functions such as modulating voices, configuring metronome and playing the demo music sources. Although not as good as the Yamaha P45, Korg B1 features nice and smooth keys. In fact, its 88 natural weighted Hammer keys will definitely impress you at the first glance. However, it fails to deliver excellent sound quality, which is the key feature a piano player wants in his/her piano. The Korg B1 comes with an inbuilt stereo system designed using the MFB Servo technology, which makes it an excellent choice for piano players as it aids them during their piano lessons or classes. Comes with an optional stand for the keyboard / Good for learning piano instructions and lessons. The piano has no midi points / Does not offer a variety of sounds / Moderate sound quality. Yamaha P45 is definitely a better choice when compared to the Korg B1. 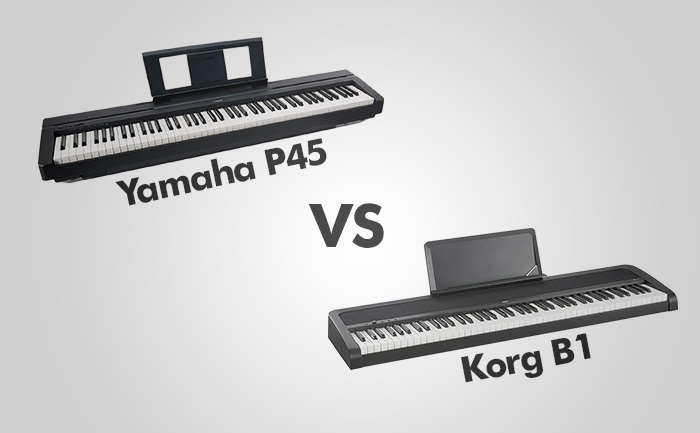 Although both the pianos are equally good in terms of design and appearance, Yamaha P45 scores higher owing to its music quality and sound choices. While Yamaha offers 10 voices, the Korg B1 has only 8 different sounds tones. If you’re a beginner who is looking to learn and master your piano playing skills, then opt for Yamaha. However, if you need a basic digital piano to take piano lessons, then Korg would be a better choice, as it is comparatively much more compact and cost-effective.